Want to stop reading and start living? Call your closest clinic today and make an appointment. Otherwise, the answers the the 9 most asked questions about heel pain and plantar fasciitis are revealed below. Why do you get Plantar Fasciitis ? Is Plantar Fasciitis the same as a Heel Spur ? Why does Plantar Fasciitis last so long ? How long does it take to recover from Plantar Fasciitis ? What are the best shoes for Plantar Fasciitis ? What else might cause heel pain that isn’t Plantar Fasciitis? Do you need to have an X Ray to diagnose Heel Spurs? Heel pain can be a terribly debilitating condition that can last for years if untreated. Every day we see people who have been told by their family doctors that there is no treatment available and it will go away eventually. This can be true. In a fair number of cases, plantar fasciitis will go away eventually without treatment. ‘Eventually’ though, could mean literally years and years of pain and disability. Even then, it is very likely to recur after a time. It is simply not true that you have to suffer this condition with no relief. This condition is one that predominately affects adults. If the pain that you are researching is Heel Pain occurring in a Child, please see our section on Sever’s Disease. Plantar fasciitis is the most common cause of heel pain on the bottom surface of your foot. The plantar fascia is a thick band of gristle that runs from the heel to the ball of the foot. It covers a large area of the sole of the foot. Unlike a tendon or a muscle, the fibres that make up a fascia are very rigid. It has a medial band which is on the inside / big toe side of the foot. There is also a lateral band that runs up to behind the small toes. It is almost always the inner medial band that becomes painful. The pain is usually bad for the first couple of minutes of standing after rest or sleep. It will then often improve before worsening again with ongoing use. Standing still may be as bad as, or worse, for pain than walking. Why do you get Plantar Fasciitis? When your foot is sitting properly, the band stretches across the arch, travelling a particular distance. The higher the arch of the foot, the shorter the distance from the heel to the toes. In a foot that rolls in (flatfoot, pronation, fallen arches) the distance that the plantar fascia has to cross increases. As the band is not a stretchy structure, this elongation will cause the plantar fascia to pull on its weakest attachment. For most people, this is at a point called the Medial Tubercle of the Calcaneus. This is directly under the heel, shown in the image shaded red. Other common places for plantar fascia related pain include around the rim of the heel and through the arch. If the tissue is under stress for a long period, the body may lay down extra bone at the Medial Tubercle. This is called a heel spur. 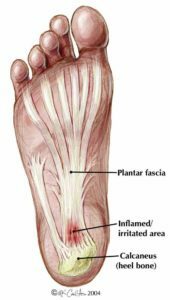 For more information on What causes Plantar Fasciitis, read this in depth discussion on a separate page. As far as a diagnosis of your pain goes, the answer is usually yes. The two terms are used interchangeably. However, just because you have heel pain, it does not mean that you definitely have a spur. Likewise, many people have spurs but no pain. It is important to know that spurs don’t cause the pain. It is the pulling that causes the spur to grow and the pulling that causes the pain but the spur does not itself cause pain. Plantar fasciitis requires professional care to determine the cause of the tissue strain. A podiatrist will be able to treat the plantar fasciitis quickly with high chances of success with a variety of treatment options. By recognising plantar fasciitis early on, the podiatrist will be able to implement a more effective management plan. Very often we will finish our assessment of your foot condition with an offer to ‘strap you up’. For most people, this is a little taste of magic, often reducing the pain by 50% within minutes. Orthotics are an important part of the treatment to resolve the condition for most people. This is because the underlying cause of fasciitis is almost always poor foot position creating too much tissue on the tissue. 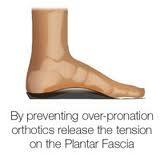 Orthotics have come a long way in recent years and are more comfortable and slim line than ever. See our page on orthotic types for more information. The podiatrist can administer an injection around the plantar fascia. This aims to bring about a reduction in the pain as well as to incite tissue repair over a number of weeks. This is particularly useful for a complication of fasciitis called Baxter’s nerve entrapment. You can find information related to prolotherapy and Neural Prolotherapy for ligaments, tendons and joints here. On some occasions, we may use a corticosteroid injection around the point of pain to settle the condition rapidly. Spurs almost never need to be cut out and surgery is very rare these days. Earlier, we discussed that the plantar fascia is a thick band of gristle. At the point of attachment of the fascia into the heel bone, the tissue splits up into thousands of fibres. Each of which punctures the bone to hang on. This anchor point is called an aponeurosis or enthesis. This zone has very poor blood flow. If you were to cut the area surgically, you would squeeze out a few of drops of blood, but nothing like what would flow by cutting skin, bone or muscle. Plantar fasciitis is an episodal condition. This means that, if you are prone to it, you are likely to suffer episodes or ‘attacks’ on and off through your life. An episode might last a month or it could much, much longer. Without treatment, the condition can go on for years. Due to the fact that fasciitis will come and go, doctors will often say “Don’t worry, it will go away by itself”. This is probably true, but five years is a long time to put your life on hold waiting for it to clear up naturally. Added to this, the older you become, the less ‘bouncy’ the collagen in your connective tissues becomes. This is the reason you get wrinkles in your skin as you age. It is also the reason why attacks of plantar fasciitis get more severe and more frequent as you age. Furthermore, increases in weight often accompany heel pain, as exercise is difficult. Weight gain can exacerbate the problem and make it harder to treat. For these reasons, plantar fasciitis is best treated early and effectively. How long will it take to recover from plantar fasciitis ? This is a multi-part question, with a multi part answer. At the first appointment with our podiatrist, several things usually are achieved. Firstly, a diagnosis will most likely be reached, unless there are complex issues involved. Secondly, treatment options will be discussed. Thirdly treatment will be commenced if you elect to do so. Treatment at this stage may involve Shock Wave Therapy , planning for orthotic supports, shoe advice, stretches (perhaps) and almost certainly taping. The taping that we would employ binds the two ends of the arch together into a shortened position. This will take the tension off the fascial band immediately. People do vary in their response to treatment but it is not uncommon that it will reduce the pain by 50% within half an hour. So, it is possible to feel better with plantar fasciitis much quicker than it is to actually achieve recovery. Unfortunately, the benefits cease when the tape is removed in the early stages of recovery. If it is decided to go down the path of making orthotics, they take around a week to make. From here, it will often take 10 days before your orthotics work to peak efficiency. This delay occurs because the foot will start out wanting to continue to work in the same pattern it always has done. You might elect to continue with the taping to reduce pain and keep the momentum of healing going during this phase. Have you ever experienced a particularly bad pain in the heels of your feet when you stand after resting or sleeping for a period? This pain may have dissipated after a few minutes only to recur once you have been standing for a little while. If this sounds familiar then there is a distinct possibility that you have plantar fasciitis and the only way that you are going to get relief is to seek out plantar fasciitis treatment.Fortunately for those living in Brisbane, the team here at Walk Without Pain podiatry clinics offer a world-class service that puts the most modern techniques and technology to effective use in relieving patients of their foot issues. We have been operating exclusively in Brisbane for almost three decades and in that time have addressed the issues that presented in over half a million feet. With a team of 9 doctors, all of whom are specialists in the field of podiatry looking after our patients, you can approach us with confidence that we will have the know-how to fix your feet as we have done for thousands of others. Our goal is to offer professional treatment services that are accessible to all. As such, we can process HICAPS rebates in any of our clinics on the spot, to ensure that you need not worry about the financial implications of your treatment, given our alliances with Medibank Private and BUPA. What’s more, with the ability to see 180 clients every day there are a lot of appointment slots available, both during work hours and outside of traditional work hours, so that regardless of what your timetable is, we will be able to accommodate you. Heel pain treatment is something that requires the attention of a professional if you wish to rid yourself of it once and for all. The sooner you present yourself to us, the faster we can make an accurate assessment and get to work addressing the root cause of the problem. Even after our initial consultation with you, there is the distinct possibility that you could see a reduction in pain of up 50% because we will strap your feet up to give them the kind of relief you probably have been dreaming about for a long time. Simple solutions such as that, as well as orthotics, which can be customised to your feet to give you a kind of support that will make a remarkable difference, are standard, however, there are alternate solutions also available. Shockwave therapy is something that we believe is tremendously effective here at Walk Without Pain. This technique sparks your body into recovery mode and prompts the increase of blood flow to stimulate repair of damage plantar fascia. Local injection is also an effective way to bring about a similar response and recovery. This technique will result in a reduction of pain, which can often be immediate, and will stimulate repair of the damaged area. Here at Walk Without Pain, we have absolute confidence in our ability to effectively treat even the most persistent or complex problems. Even if you have been to countless podiatrists in the past, we encourage you to make contact with us and book an appointment. Our team has a wealth of knowledge that is second to none and with our continued dedication to ongoing learning, you will find a team ready, willing and able to bring the most advanced solutions to the treatment of your problem. So, if you want plantar fasciitis treatment in Brisbane that could finally put that aching problem to rest once and for all, get in touch with the team here at Walk Without Pain today. We provide bulk bill podiatrist in Brisbane including plantar fasciitis treatment and shin splints treatment. Speak with one of our specialists today to find out more. Read more about the best shoes for plantar fasciitis here. Do I need to X Ray Heel Spurs to confirm Plantar Fasciitis ? Wouldn’t it be nice to Walk Without Pain?